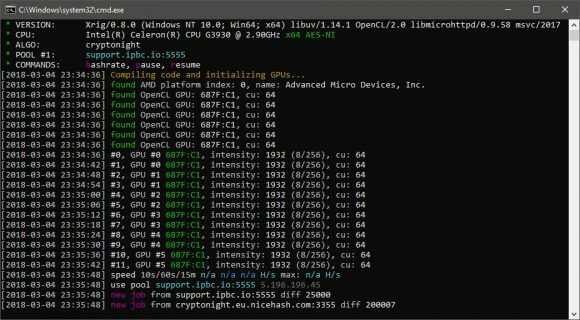 It seems that there is a new Cryptonight miner out there optimized for AMD RX Vega GPUs called Xrig, though it should also work on other AMD video cards. Performance wise it should be similar to other high-performance AMD RX Vega miners like Cast-XMR or XMR-stak, meaning 1900-2000 H/s, depending on the settings. What makes it more interesting is the built-in hardware monitoring as well as options to configure clocks and voltages via a config file. Xrig is open source, though the default Windows binary is with 1% dev fee included and it apparently starts with developer fee mining when you run the miner before it continues to your configured pool. The miner comes with GPU reset script and devcon.exe bundled, however it may not work out of the box as you need specific version of devcon.exe depending on your Windows version. So if the bundled devcon for the Windows does not work for you, here is an easy way to obtain the required devcon version. 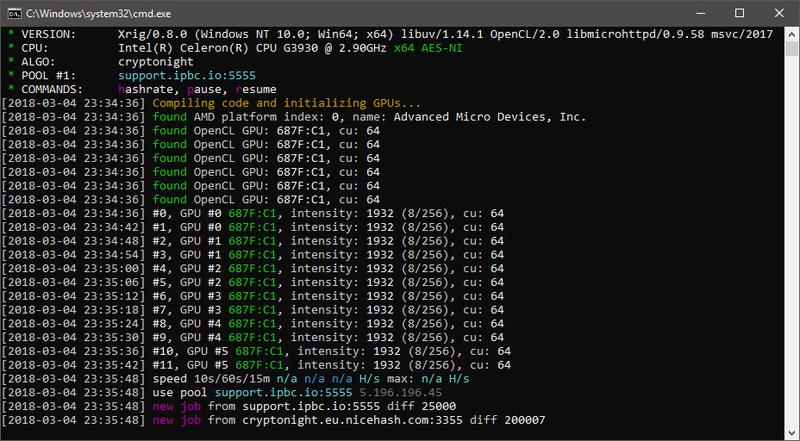 Other than that, well you should try the miner and compare what kind of performance you are getting with it on your Vega 56/64 GPUs or other AMDs an if it works better than other alternative options. If not using a config file (you need to create one, example is available on Github) do not forget to set the intensity command line parameter in order for the miner to work.